What is the message behind Prime Minister’s salary cut? As the headline reveals, a Cabinet paper received by the Samoa Observer confirmed that a proposal by the Ministry of Justice and Courts Administration to raise the salaries of Justices in the Supreme Court, Judges of the District Court and the Land and Titles Court had been given the nod. But there was something far more interesting in F.K. (18) 17. Buried among the salary raises for the Judges of the Court was a small note at the bottom about the Prime Minister’s salary. It just said that the Prime Minister’s salary of $187,500 per annum is subjected to a restructure as recommended by the Salary Tribunal so that it would eventually be reduced to $182,070 per annum. That is a reduction of $5430. Now in the bigger scheme of things, the amount is probably insignificant. There are other ways where the holder of the Prime Minister position can make up for it. Still, the idea that the Prime Minister’s salary has been slashed will no doubt raise eyebrows with people asking a lot of questions. Which should be the case. Folks, here we have all Judges of the Court being given salary raises and yet the holder of what is arguably the most important position on the land has had his pay cut. What message is the Government sending out with this decision? And to ensure his point is well and truly hammered home, Olo struck an emotional nerve. And why should the Prime Minister’s salary be increased to that amount, Olo was asked. Now that’s a new one, in as far as most people are concerned. But that’s not all, Olo said. There is no doubt about it, Olo has a valid point, one many Samoans would agree with. 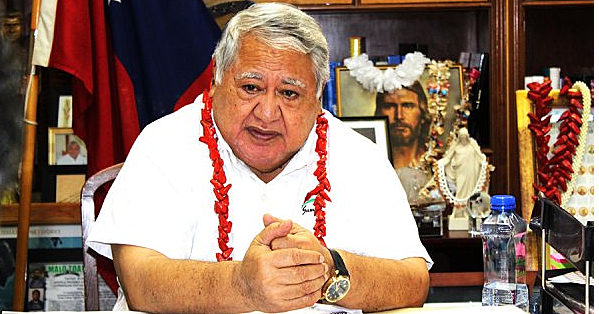 The fact is that whether you love or loathe Prime Minister Tuilaepa, his work over the years speaks for itself. Come to think of it, there must be method to thy madness. We know Tuilaepa is the man lording over Cabinet, which means that he would ultimately have had the final say in this matter. Obviously Prime Minister Tuilaepa is sending out an encrypted message not just to his party, public servants but also the entire population. Coming at a time when the Government has come under enormous scrutiny for raising taxes and forcing Church Ministers to pay taxes, this decision is well calculated and well timed. And what is the message? Well don’t be shy, tell us what you think? Have productive Thursday Samoa, stay tuned and God bless!